Order books are now open for Hyundai’s Nexo hydrogen fuel cell electric vehicle, which is priced at £65,995 (incl the Government’s Plug-in Car Grant). 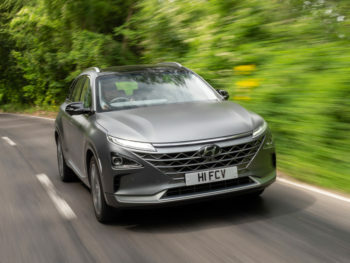 Only available from Hyundai direct, the Nexo SUV (see road test here) is the replacement for the ix35 Fuel Cell (FCV) as well as one of the 44 new electrified models that Hyundai Motor Group has pledged to launch by 2025. Unlike its predecessor, the Nexo will be offered in right-hand drive. It also gets an official WLTP-rated range of 414 miles based on the combined cycle – compared to 369 miles on the old NEDC test cycle for the ix35 – while system output is up to 163hp compared to 136hp for the ix35 FCEV. Available in one high trim specification, the Premium SE features 19-inch alloy wheels, gloss black door mirror housings and silver detailing while the interior brings a two-tone trim incorporating cloth and faux leather seats, with full electrical adjustment on the heated and ventilated front seats, whilst the rear outermost seats offering independent heating. The Nexo has also been independently validated for its use of bio materials throughout the interior, which include bio fibres made from sugar cane waste and vegetable plasticisers in the headliner and carpet areas. Specification includes dual-zone climate control, sunroof, rear centre-console ventilation, heated steering wheel, USB and QI wireless charging points and smart electric tailgate while the Nexo also gets a 7.0-inch LCD supervision instrument cluster, providing important driving information such as speed, fuel, temperature, power and odometer gauges, and a 12.3-inch high resolution LCD screen showing the 7 speaker Krell audio’s functions, that include standard Apple CarPlay and Android Auto, as well as the standard navigation system. Responding to feedback from ix35 Fuel Cell customers, Nexo can also provide real time vehicle condition information, including energy flow and hydrogen tank operating conditions ,as well as air purification and CO2 reduction levels that Nexo achieves in normal driving conditions. Nexo’s 3 hydrogen storage tanks, which already conform to independent rigorous testing standards, are further contained within a specially designed tank protection structure, which is designed to absorb high energy impacts without transferring impact loads through to the hydrogen tanks. Driver assistance and convenience features include Lane Following Assist, Lane Keep Assist, High Beam Assist and Adaptive Cruise Control as standard, along with Remote Smart Parking Assist, whereby the driver can exit the vehicle and control parallel and perpendicular parking as well as forwards and backwards manoeuvres from Nexo’s keyless entry handset. Standard features also include Autonomous Emergency Braking, Blind Spot Detection, Rear Cross Traffic Alert, Driver Attention Alert. All Nexos come with Hyundai’s usual five-year unlimited mileage warranty, roadside assistance package, five-year annual health check, 12-year anti corrosion warranty and eight-year hybrid battery warranty.